In Febrauary 2015 I left MonsterWorldwide after 3.5 years and also the online recruiting industry. It was a great time with great learnings. If you never worked in that area you might think even the online part is still old-fashioned, slow and boring, but this is not the case. It is a dynamic and innovative industry that is currently in a dramatical change process. In opposite to other classified segments such as online travel or online real estate, technology is not the main driver of change and innovation. The object itself – jobs and the working force – are changing and forcing the innovation process in this industry. Even today jobs are demanding different and new skill sets compared to a similar position ten years ago. And this is oynly the beginning. Transdisciplinarity, cross-cultural understanding, a design mindset and social intelligence are just a few of the new skills that are required in general beside a specific job qualification no matter if it is a marketing, product, sales, HR or IT position. Additionally there is an increasing demand in companies for highly specialized skills and very specific working experience. The demographic change is driving new challenges. On the other hand the workforce is changing with the generations Y (in 2020 35% of the workforce), Z (in 2020 12% of the workforce) and alpha (born after 2010 – still some time for us to prepare). Classical job boards are getting less important because already 50% of employees do not want to search for a new job anymore actively. Those want to be found, to be recommended or to get a job recommended by a personal contact. In the decision process to chose a specific job offer are parameters like flexible office hours, work-life-balance, company culture and non work-related benefits more important than in generations before. The time employees are staying in one company will be reduced below 2 years. So change is more a part of the DNA of such next generation employees. It is much more organic driven than forced by dissatisfaction with a current job. This type of employee is highly skilled, active in social networks and well connected. 54% even use social networks for work or skill related activities. So the future workforce seems to become in a majority a kind of passive job seekers. Employers need to build a new recruiting philosophy in their HR departments. 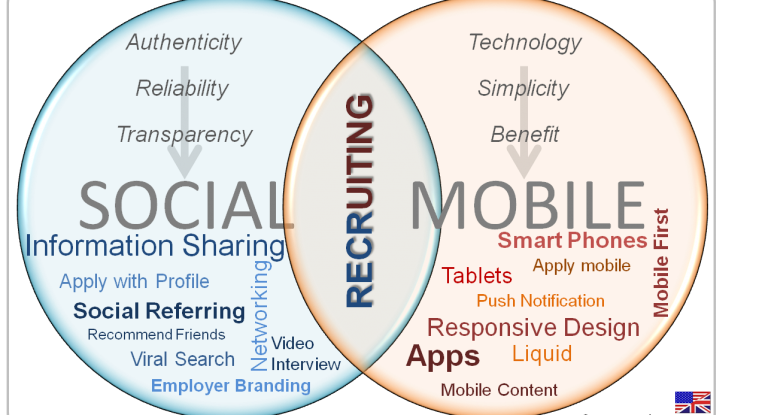 How does the current online recruiting market match these changing requirements? Companies like Careerbuilder, Monster Worldwide or Stepstone did not really manage to reinvent their business models so far, even job aggregators such as Indeed smell a little bit outdated in such a scenario. Professional networks like LinkedIn and even the German local player Xing seem to have better preconditions, but their member profiles do not all have the required details on very specific skill sets e.g. for potential IT candidates. Profile aggregation providers such as TalentBin or Dice have at least a partly answer to reach specific rare candidates in groups that are very active in work-related communities, e.g. developers. Technological innovations need an organizational foundation of change. Not surprisingly disruptive approaches are coming more from start-ups while the big online recruitment players are struggling with decreasing revenues and internal structural problems. Change needs to be driven from inside to outside, but this is difficult if key stakeholders are not pushing and supporting that approach and tend to protect the „old“ business and a given internal status quo. Change should also ideally be driven top down, what is getting difficult escpecially in companies with multiple hierarchical levels. To realize a technological shift companies need an innovation friendly organizational structure and climate. So what is close or even has started? 1. 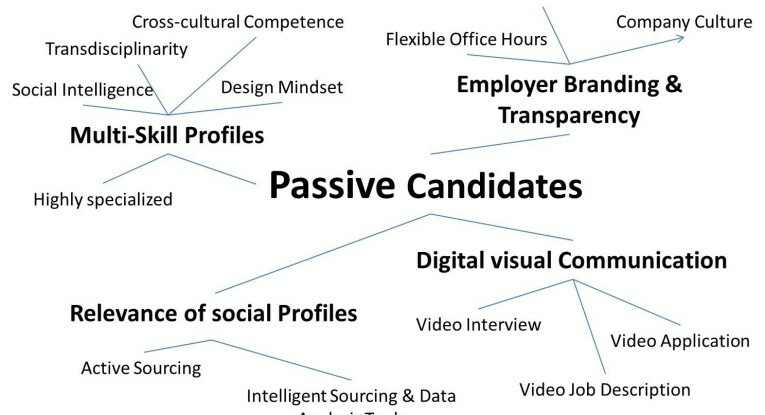 All employees are passive candidates. It will become even more difficult to reach high potentials and specialized experts via job boards and career pages. Active sourcing will be the much more active way to find the right people. Companies need to use their employees, build candidate networks and establish active sourcing directly in their HR departments. 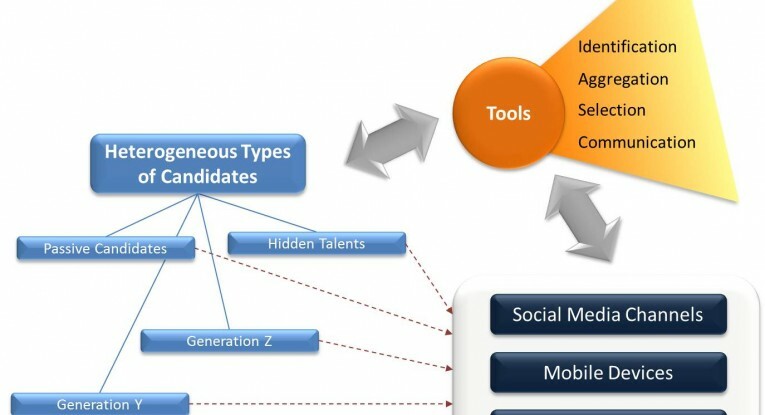 Still there is lack of knowledge and sensitivity how to contact potential candidates. 2. Social profiles keep to gain relevance. To scan social profiles and activities is getting more and more important especially as the number of passive candidates is rising. Companies need intelligent tools to scan all relevant profiles and to analyze data. 3. Companies need to invest much more in employer branding. Highly skilled candidates might have multiple options and are looking critical on potential new employers. Companies need to create a transparent view on company culture, benefits and career perspectives. Happy and satisfied employees are one of the best arguments. 4. Candidates are becoming highly specialized alrounders. The new workforce is getting much more specialized than any generation before, but brings also a set of cross functional skills from other disciplines. The role of videos is increasing in every part of the recruiting process. Companies are presenting roles, workspace and colleagues in company videos, candidates are sending videos as application or example of their work, interviews are done via Skype or other video phone applications. Since nearly ten years we are talking about Web 2.0, Social Web and how new technologies have changed our daily live and business. Today we face four digital mega trends that are catalysts of change: mobile internet usage, cloud computing, social communication and analytics / big data (Source: PWC, Gartner). Product management and development paradigms have massively evolved into an agile, dynamic and user and customer centric approach. Organization forms of companies are getting leaner and smarter to be able to act, react and execute in a much more competitive and dynamic market environment. If the implementation of “change” is successful and sustainable the positive effects are visible in mostly all parts of a company, no matter if marketing department, service or sales team. How about the recruitment department? 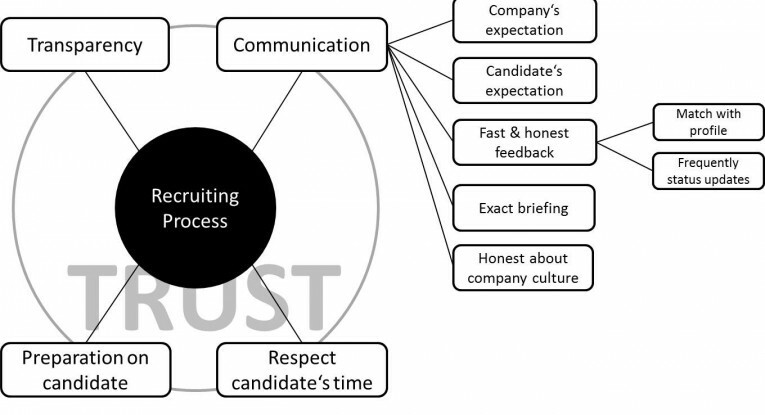 In the last twelve month I talked to candidates and companies, but also to friends and colleagues in semi-structured interviews about their experience with “active sourcing” and companies’ recruiting processes. Strictly speaking active sourcing is not a new concept. External recruiting-consultants have been sourcing actively for potential candidates since more than 60 years, but mostly focused on executive search. So what is new since Web 2.0 emerged? Professional social networks, blogs and other online communities make it easy for “everybody” to search for talents online. Many employees show skills and professional experience in their social profiles as a kind of reduced resume or release knowledge related articles in personal blogs and special interest communities. So active sourcing is not a tool only to search candidates for executive positions anymore, but for any role that is hard to fill. This is in line with expectations of potential candidates as 40% would prefer “to be found” instead to search themselves for a job (source: Recruiting Trends 2014). The passive job hunter is on the rise. So, it is easy to search for candidates in the web. The flipside of this coin is a low average quality of how candidates are contacted. In some cases recruiters send superficial personalized messages on LinkedIn (or Xing in Germany) that sound like a kind of bulk mails with job offers. Often candidates seem to be selected by a few fitting keywords without accurate research on current job title, skills, education or career level. This is a very impersonal and superficial active sourcing approach and it creates a negative perception on the candidate site. Some other recruiters contact candidates directly via phone without sending an email or message before – obviously with the principle “give it a try”. It seems to be faster to make three minutes a cold call instead of reading five minutes more carefully the profile or to search for additional information about the candidate on blogs or a personal website. Those that act here as “recruiters” are of course not always experienced professionals. In some cases even students or interns without any recruitment experience make the first contact. As a scientific research recently found out recruiters spend an average of six seconds to scan a resume and to decide if a candidate fits or not. Recruiters self-reported they would spend four to five minutes per resume (source: TheLadders). Even at executive search it is obviously not always common to be well prepared before talking to potential candidates. More than 40% of targeted candidates reported that they felt the recruiters were not well prepared in the interviews (referring to an interview stage after agreement on a general interest from both sides). Although those candidates were contacted by the recruiter they found themselves after reflecting some interest already in a one-sided applicant position. Today we have a candidate market in many industries. An application process needs to be bilateral. Companies (and also recruiters) have to understand that they must apply for a candidate too. What are the most important requirements candidates expect from recruiters? So transparency and communication are most important to set the right expectations and build trust. Without feedback there is no base for trust. It was often reported by candidates that after reaching a specific stage such as being presented from the recruiter to the company or having the first interview with the company, there was no feedback at all. In some cases it took weeks, in some months and in some cases the candidate never heard anything again from the recruiter. Of course that is the worst case. But after a candidate invested time in a recruiting process, it is naturally that he expects this his time invest is respected. And to get at least a short feedback about the main reasons for rejection is a fair expectation.